On the 3rd of June for the second time at Molde University College begun the NOFOMA(The Nordic Logistics Research Network) Conference with its traditional prelude NORDLOG or so called Doctoral Day. 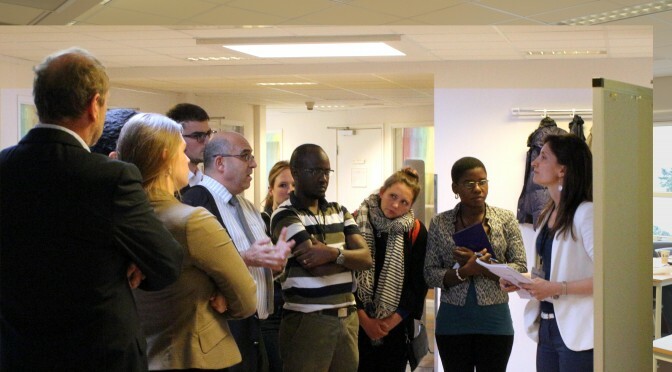 The Doctoral Day was attended by PhD students from all around Scandinavia and members of general public. «The purpose of the NORDLOG is to teach people how to be researchers» summed up Associate Prof. Bjørn Jæger, the main organizer responsible for the Doctoral Day. The program was opened by a quick introduction by vice-rector for research of Molde University College Harald Hjelle. Followed by useful lecture on Efficient Academic Writing by James Hayton PhD an author of a book PhD: an Uncommon Guide to Research, Writing and PhD Life. Target of the lecture were mainly the PhD students and their dissertations . His perspective of balancing the carelessness and professionalism opened ways how to handle task as large and complicated as PhD thesis is. Lecture by James Hayton and his interesting pointers. To battle one of the largest foes of current student public, the internet procrastination, James Hayton suggests fairly drastic measure which he himself applied on his dissertation. Which is cancelling internet connection. Effectiveness of this method is proved by the fact that he managed to finish his dissertation in mere 3 months. Was one of the many advices James Hayton, PhD also provided. Prof. Øyvind Halskau presenting doctoral studies acomplisments of Molde University College. Help with academic writing, much appreciated by the audience, was then expanded by the editor of International Journal of Physical Distribution & Logistics Management Prof. Alex Ellinger from USA. Rather amusing lecture offered usefull insight into generall creation of academic pappers which aim to be published in journals. Proffesor Alex Ellinger suggested authors to ask themselves questions cunnigly simple, such as „Who cares?“ or „ So what?“ Meaning the subjects of said papers. Those supposingly obvious suggestions attracted the most attention of the audience out of all given during the day. Prof. Patrik Jonsson then offered a guide to revision of academic papers for scientific journals. Considering the present audience this provided further guidelines for production of those such articles. Folowing initiative was then taken by PhD student individually presenting their researches and receiving feedback from present lecturers with that the set of presentations of NORDLOG ended. Associate Prof. Bjørn Jæger, the main organizer responsible for the Doctoral Day. „The next two days or NOFOMA are going to be about getting together and sharing ideas benefiting research“ Promised Associate Prof. Bjørn Jæger.